The perfect upgrade for the Glock 17 and 19! The revolutionary USW concept from B&T is now also available for the Glock 17 and 19. 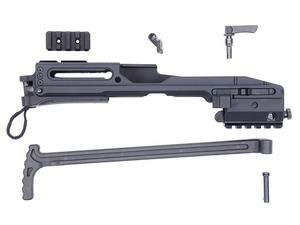 The built in side-folding stock allows the user to shoulder the weapon for more precise shots. Features the ability to accept red dot sights and uses a folding charging handle. The USW-G17 conversion fits Glock Gen3-5, 17 and 19 models with a standard rail. *Conversion kit only. Pistol, light and optic are not included.